This article will provide the steps to add additional users to your Sfax account. Your user account must be set as the Account admin in order to add additional users to your account. Once in the Settings area select the Manage users option. 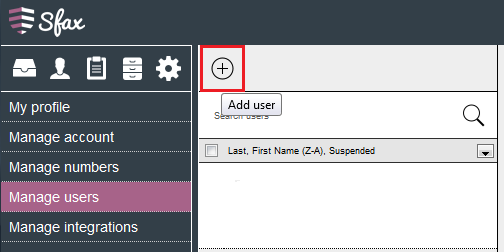 Select the option to Add user. After selecting the Add user option you are presented with the Add user box which allows you to input the user information. 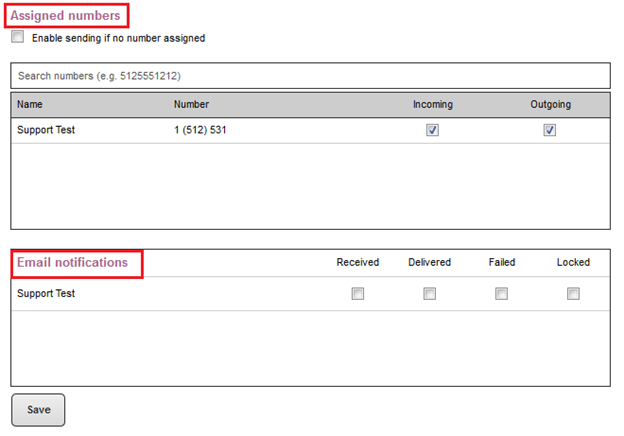 The field for Role allows you to select from either Account admin or Account user. Account admin will have admin rights such as managing user accounts. Account users have the ability to utilize the service but are unable to make changes to the account management portions. 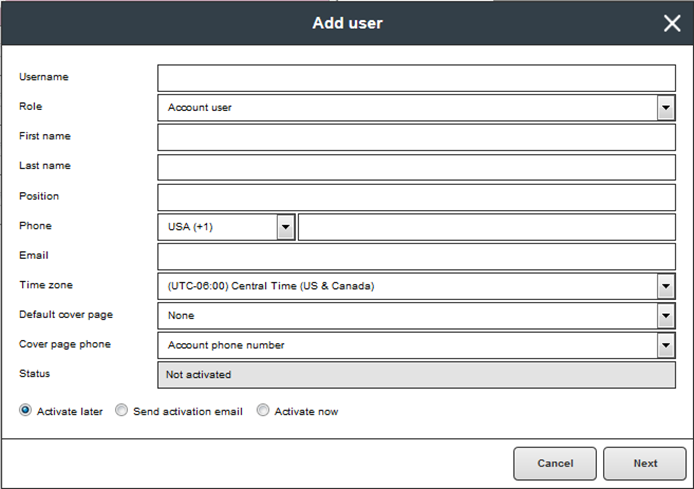 With each user account you can set the time zone, assign default cover pages, and default fax number. You are unable to select the Default fax number until after you have assigned a fax number in the next steps. After you have input the user information you have the option to either Activate Later, Send Activation Email, or Activate Now. Once the user is created and you are ready to activate them, you'll have the option to Activate at the bottom of their account information. Select the user you wish to activate and either Send them an Activation Email, or Activate it yourself. 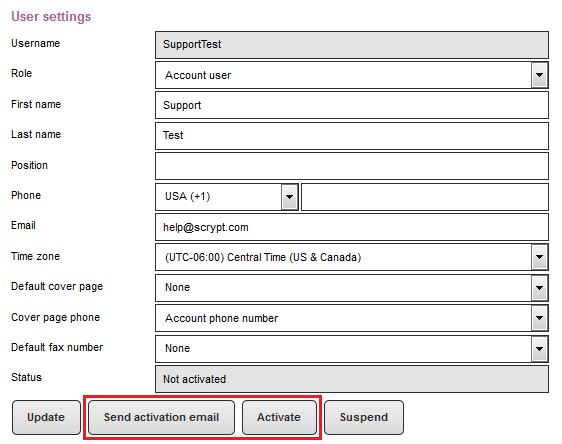 Send Activation Email will send an email to the email address input to complete the setup of the user account. When creating the user, you can select this option, which will send the email upon completion of the User account. The email will provide a link for the user to setup the password for their user account. Activate Now will allow you to provide your own credentials to the user for them to log in. This can be selected during account creation. Or if you have selected the Activate Later option, you can assign the password then by clicking the Activate option. This will pop up the Activate User option. 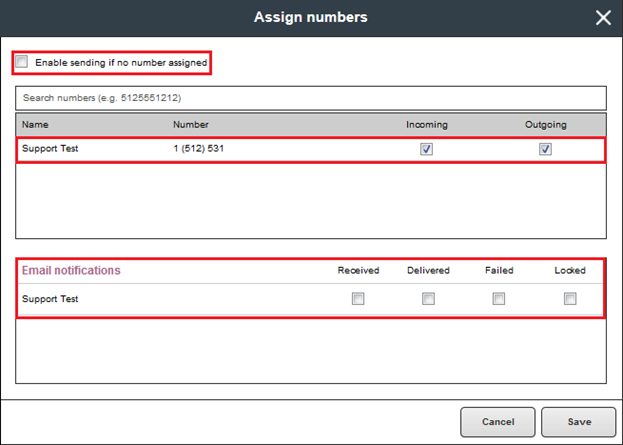 Once you have the information input for the user account and you select Next this will take you to the Assign numbers section. At this point you can enable the user for sending only which only enables the account to send outbound faxes. If you would like to assign a fax number to the user account place a check in the fields for Incoming or Outgoing or both depending on what actions you want to allow the user to perform. If you have multiple fax lines on the account you can assign the user to multiple lines. Once you make your selection the options for Email notifications are enabled to be selected. 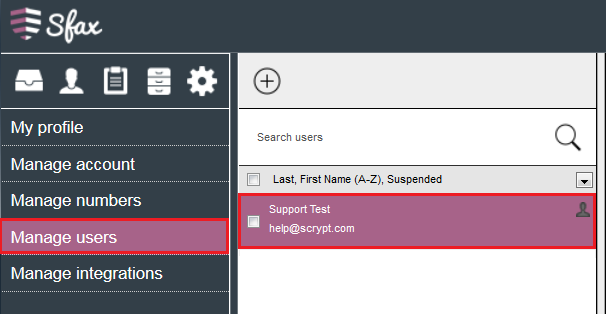 As the admin you can lock the options for email notifications for the user account. Once you have made your selections select the Save option. 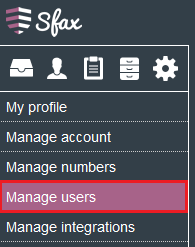 Once you have saved the user information the user will now be displayed under the Manage users area. 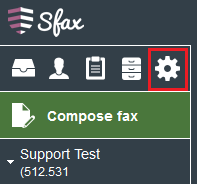 To set the default fax number and/or the default cover page select the user account and the user settings will display on the right side of the screen. After selecting from the drop down and selecting the default fax number and/or default cover page select update to save the changes. Under the User settings you have the ability to see and edit the Assigned numbers, Email notifications, and Security preferences. The field named Locked under the Email notifications allows the admin to lock the notification settings and disabling the user from make changes to these settings. The Security preferences area has two options to select from. 2-Factor Verification will authenticate for all login attempts, whether from the Web Portal, the Print Driver, or the Sfax Mobile Viewer app. 2-Factor Verification will send a text message to the associated mobile number with the PIN number. A mobile number is required to enable 2-Factor Verification. Below is a description of the three options available. Disabled – 2-Factor Verification is not required for all log in attempts, whether from the Web Portal, the Print Driver, or the Sfax Mobile Viewer app. The username and password are only required. 30 day and one-time PIN's - This setting will send a PIN via text message to the mobile number input for the user account. The PIN is valid for 30 days and after the 30 days a new PIN will be sent via text message. The user will then need to input their username and password and once this is authenticated they will then be prompted to input their PIN number. Once both sets of credentials are authenticated the user will be able to use the Web Portal, the Print Driver, or the Sfax Mobile Viewer app. One-time PIN's only - This setting will send a PIN via text message to the mobile number input for the user account. The PIN is only valid for one usage of the Web Portal, the Print Driver, or the Sfax Mobile Viewer app. At the next launch of the Web Portal, the Print Driver, or the Sfax Mobile Viewer app, a new PIN will be sent to the mobile number. The user will then need to input their username and password and once this is authenticated they will then be prompted to input their PIN number. Once both sets of credentials are authenticated the user will be able to use the Web Portal, the Print Driver, or the Sfax Mobile Viewer app. The Prevent 'Remember me' setting allows for the user account to be enabled to set the remember me option when logging into either the Sfax driver or the Sfax web portal. This option will remember the username but will not save the password. The user will still need to input their password to authenticate.